A new era in space communications started on Friday, January 19, with the successful launch of an ultra-low-cost telecommunications satellite from Canada-based Kepler Communications — this mission serves as a technology demonstration for Kepler’s Ku-band telecommunications payload. With this launch, the Canadian start-up becomes the first commercial company ever to launch and successfully operate a LEO communications satellite in Ku-band. This highly valuable frequency band is ideal for telecommunication services, and is currently being sought for use by many companies planning on deploying mega-constellations of satellites. Kepler’s network of satellites will eventually enable in-space connectivity for other satellites, space stations, and transport vehicles. This incremental deployment approach has driven Kepler’s inaugural service, which focuses on relieving the high cost and limited bandwidth real-time satellite connectivity with a delay tolerant service. The number and size of operational spacecraft in Kepler’s constellation will vary at times based on customer demand and new applications. Each satellite added to the network will incrementally increase overall throughput and reduce revisit time. The initial Kepler nanosatellite was launched from the Jiuquan Satellite Launch Center (JSLC) in Northwestern China with launch service provided by China Great Wall Industries Corporation and contracted through Innovative Space Logistics. Jiuquan, founded in 1958, was the first of China's four spaceports. This marks the 100th successful launch from JSLC to date. More Chinese launches have occurred at Jiuquan than anywhere else in the country. Kepler is the first Canadian spacecraft ever launched from China. 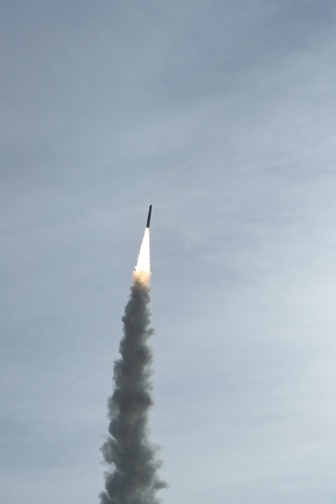 Kepler's Clyde-Space manufactured KIPP smallsat en route to orbit following the launch at Jiuquan Satellite Launch Center in China. The Kepler spacecraft was built in partnership with Clyde Space Ltd., who provided the spacecraft bus, as well as Bright Ascension Ltd, who provided the on-board software. The Kepler ground support network was built in collaboration with Comtech EF Data, Kongsberg Satellite Services, Innovative Solutions in Space, and Nextologies. The Kepler payload was developed in collaboration with Enclustra and AHA (of Comtech EF). The successful deployment of Kepler’s first nanosatellite is a key demonstration of the company’s core technologies: software-defined radios and antenna arrays that can efficiently exploit available spectrum from space. Kepler has several customers already signed up to take advantage of the backhaul service available from the first nanosatellite. The firm sees a market opportunity for providing narrowband satellite connectivity to enable IoT. Company CEO Mina Mitry said that the firm is the first to deploy a Ku-band LEO spacecraft. While the goal of Kepler will be to establish an in-space connectivity network, the need for a sustainable and incremental deployment of services and technologies is recognized in order to achieve this goal. Mitry then added that there is a tremendous amount of data out there that doesn’t need real-time connectivity, but just needs to move — GIS data, aggregated IoT sensor data, CCTV backlogs, even media. Kepler can move high volumes of this data, do it cheaply and improve QoS with every new satellite the company launches. The challenge with IoT is that to create a truly compelling business model, you need lots of devices connected. That requires pricing and performance on par with terrestrial wireless. The amount of spectrum in Ku-band presents a viable way of doing this, but there needs to be substantial technology advancements before we can get there. Being the first to actually deploy a LEO Ku-band system gives the company a first-mover advantage. As the need for connectivity increases, the firm's constellation capacity is increased in tandem and this is how an LEO constellation is sustainably deployed. The market for IoT connectivity is compelling. Applications include asset tracking for railcars, shipping containers, or construction equipment. It includes connecting soil moisture sensors, seismic monitors, or even refuse bins. Mitry noted that the company can see applications that require 100s of millions of connected device. But this only will be realized if the firm can get the user devices to the price, power, and size that enable customers to reach large scale deployments. The spacecraft manufacturer, Clyde Space, designed and built two advanced smallsats for Kepler Communications, with the first attaining LEO last Friday. According to Kepler, they established contact with the satellite just a few hours after the launch. Photo of the Clyde Space manufactured KIPP smallsat. Photo is courtesy of Clyde Space. This cutting-edge Clyde Space smallsat, built in the heart of Glasgow, Scotland, will support Kepler Communications in deploying their in-space telecommunications network, which will relay data for devices deployed in remote regions. 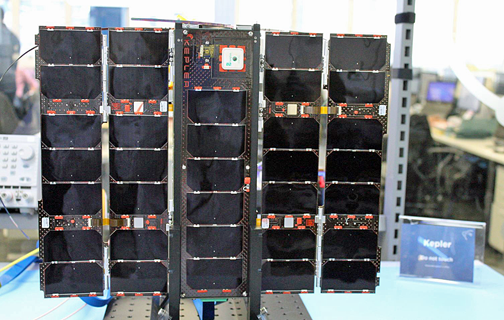 This pilot satellite, an advanced 3U cubesat, carries Kepler’s novel Software Defined Radio (SDR) and antenna array, making the company the first commercial firm to launch and operate an LEO communications satellite in Ku-band. The Kepler network, supported by the Clyde Space smallsat technology, will open new business opportunities for applications such as bulk data transfer and IoT (Internet of Things). Data gathered by the constellation will have a range of applications from intelligent shipping to smart agriculture to improve health and safety. Clyde Space CEO Craig Clark reported that a new era of space-based communications is now being entered. The smallsat was designed, built and delivered for launch in just 12 months. The mission is supported by on-board and mission control software from Scottish firm Bright Ascension. Bright Ascension developed the flight software in five months with the final integration and testing completed at Clyde Space's Glasgow facilities in December of last year before the spacecraft was shipped for launch. The company also provided the Mission Control Software (MCS), which will be used by operators at Kepler Communications to communicate with and control their spacecraft from the ground in real-time. The MCS also provides automation features to allow Kepler to control their operating costs and provide a service to customers more effectively. This is Bright Ascension’s second successful mission after the launch of UKube-1, the first satellite to be built in Scotland, in 2014. 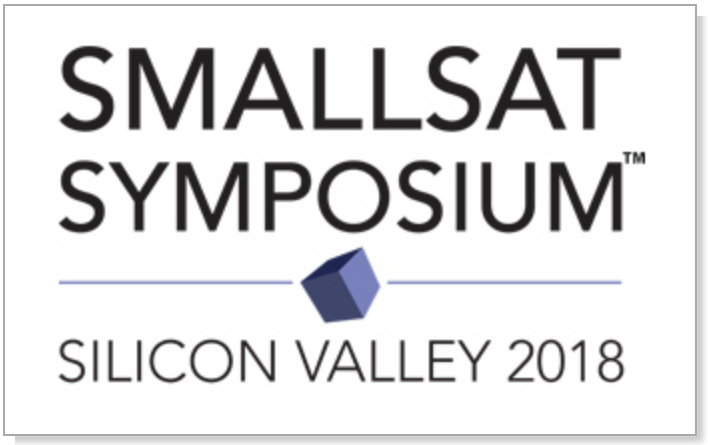 Just a few days remain for interested companies and individuals to register to attend the upcoming SmallSat Symposium (February 5 through 8, 2018) in Silicon Valley, California. Network, learn and enjoy the company of your peers and subject matter experts who will envelope attendees with up-to-date knowledge of the SmallSat market segments. Learn more at smallsatshow.com.